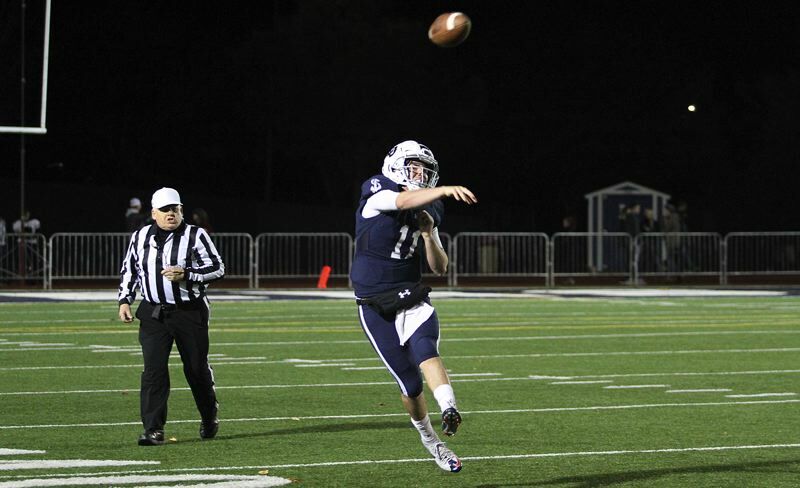 "Every team is going to come out firing against us," said Lake Oswego senior quarterback Jackson Laurent, who went 17 of 27 passing for 279 yards and four touchdowns. "They're going to come with everything they have, but we know if we start well and play good, they'll fold eventually." "Coach (Steve) Coury does a really good job of preparing us — he has a great game plan every week," said senior tight end/linebacker Chris Todd, who made three catches for 48 yards and one TD, and also had one of his team's two interceptions. "They have a really good running back and we wanted to make sure we could contain him and I think we did a very good job doing that. It usually comes down to four or five game-changing plays in the game and we just made plays at the right time." With the win — Lake Oswego's sixth straight — Lake Oswego improved to 9-1 overall after winning the Three Rivers League title. Next up, the Lakers will host 16th-ranked TRL foe Oregon City (5-5 overall) — a 60-35 winner over Grants Pass on Friday — in the second round of the state playoffs next week. "Now we're just looking to go game-by-game," said Lake Oswego senior lineman Tanner Hall. "It will just take good preparation through the entire week of practice, good focus and the mindset that we are going for the win." "It will take lots of hard work," agreed Todd. "I think it will be great — I love playing at home. Our student section always brings it every week. It's going to be a good atmosphere." Neither team scored on their first possession on Friday, but when Lake Oswego forced the game's first turnover, it set the stage for the night's first touchdown. That turnover came when junior defensive back Joe Hutson picked off a Colby Neron pass intended for Chance Costanzo at the Black Tornado's 29-yard line and returned it to the 40. "I did get that first pick over there — that helped us get going," said Hutson, who also made two catches for 65 yards and two touchdowns. From there, the Lakers drove 60 yards on six plays, getting 39 yards on five carries by junior Casey Filkins, including the 5-yard score up the middle with 4 minutes, 7 seconds left in the first quarter. Diyar Dezay's extra point kick — the first of his six on the night — gave LO a 7-0 lead. North Medford answered just 15 seconds later, however, sending senior running back Elias Spence around right end and seeing him break free for an 82-yard score that — after a failed PAT — brought the Black Tornado within 7-6. Undaunted, the Lakers just kept rolling, scoring on each of their next three possessions to rack up a 28-6 halftime lead. First, they drove 79 yards to extend their lead to 14-6, getting a 28-yard Filkins run, and later, a 26-yard Laurent-to-Todd scoring strike at the right flag. Next, after the Lake Oswego "D" forced a punt, the Lakers marched 80 yards in seven plays to score, closing the drive with a 39-yard TD pass from Laurent to Hutson with 4:38 left in the half. And finally, after stopping North Medford on a fourth-and-two near midfield, the Lakers went 51 yards in just three plays, capping that series when Laurent connected with senior wide receiver Jacob Ferbache for a 29-yard TD and that 28-6 lead at the half. "It was just fun to be able to come out here and throw the football after all the rain last week," Laurent said, looking back to his team's regular-season ending win over Lakeridge a week earlier. "My line really gave me a lot of time to throw and the receivers did a great job of looking for me and coming back and sticking on their routes." "We know that Coach Coury always gets us fired up, always gets us going," Hutson said, adding that "Jackson really threw the ball well tonight." The Lakers then scored on two of their first three possessions in the second half to put the game on ice. First came a 73-yard drive that included two Laurent completions for 29 yards and four carries by senior running back Keenan DeRaeve for 28 yards, including the 5-yard score over left guard with 8:30 to go in the third quarter. Then, after a trade of punts, Todd picked off a Neron pass near midfield and took it back to the Tornado 35. From there, Laurent went to Hutson again for a 26-yard score at the right flag that provided the final 42-6 margin with 1:42 remaining in the third quarter. The Lakers rested many of their starters the rest of the way, with the LO defense still keeping North Medford at bay through the contest's final quarter. "We just had to get used to … that stunting (of the North Medford defensive line) at the beginning, but we just kind of picked it up as we went," Hall said. For the game, Filkins carried 11 times for 75 yards and one score in less than a half, Ferbache had three catches for 50 yards, and junior Thomas Dukart three catches for 49 yards. Spence led North Medford with 20 carries for 141 yards, Neron went 6 of 11 passing for 42 yards, with Jett Carpenter catching four passes for 29 yards.